We are honoured to offer you such an extraordinary venue as Quadrille boutique hotel for organization of one of the most important events in a person’s life. This 18th century palace is surrounded by a picturesque and quiet park which boasts a number of enchanting paths and architectural features, an atmospheric lighting and an impressive fountain and a pond. 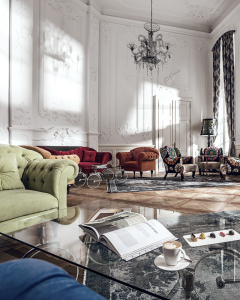 Historic interiors underwent thorough renovation aimed at combining tradition and modernity, as well as creating a unique design hotel with a leitmotif of Alice in Wonderland. 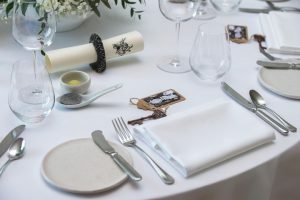 Sophisticated cuisine, professional service and elegant design will create a unique atmosphere on this special day. We offer a tasteful banquet interior, suitable for organization of wedding receptions for up to 110 guests. 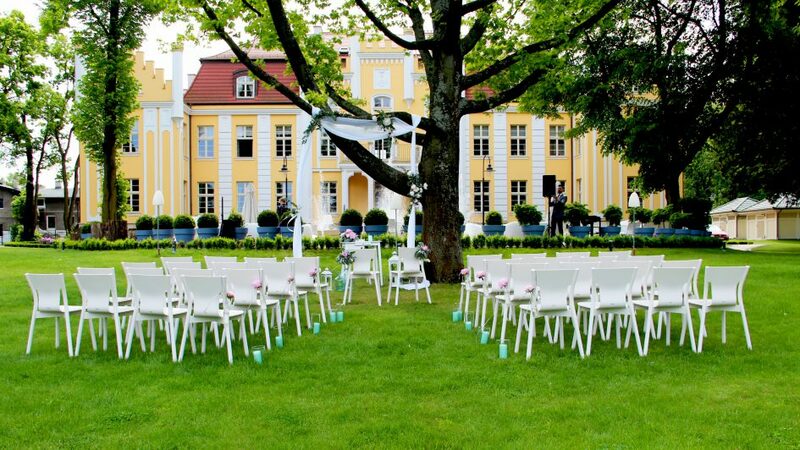 A picturesque scenery of the park and palace complex is a perfect venue for organization of an unforgettable wedding ceremony and extraordinary photo sessions. All of this awaits you away from the hustle and bustle of city life and yet very close to the centre of Gdynia and Sopot and to one of the most beautiful Baltic beaches in Orłowo district. Trusting us with organization of your wedding reception, you can rest assured that we will do everything to make it absolutely unforgettable and unique. Our experienced wedding coordinator will provide you with various arrangement options and wedding scenarios possible at Quadrille, as well as lead you through the windings of wedding preparations, take care of the smallest details, advise and recommend reliable subcontractors, as well as make sure that every aspect of the event is just as you have dreamt it to be. We would like you to feel like home which is why we recommend that you plan your pre-wedding stay at Quadrille. It will be a great opportunity for you to experience the level of our services, get acquainted with the venue and taste the delicacies prepared by the Head Chef of the White Rabbit restaurant. Choosing the right place for your wedding ceremony and reception requires time and your full attention, at Quadrille we do our best to make it an exciting and memorable adventure. • preferential rates for accommodation when renting the entire facility. After the season or in case of bad weather, we will be happy to offer you our enchanted Ball Room with charming interior design, which will be arranged in accordance to your requirements and number of guests. 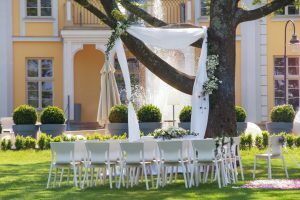 Here, you will exchange your wedding vows with a view of a green park and drink a toast in a historic foyer or the restaurant with a view of a colourful garden. Wooden parquet, white decorated walls and high ceiling with beautiful chandeliers will surely delight your guests. Properly decorated interior will give your ceremony have the value of uniqueness and exclusivity. Whenever you find time, we are happy to invite you for walk in our park followed by a cup of aromatic tea or coffee while we answer all your questions and present the Palace and its interiors. We will also discuss other variants of our offer such as hen and bachelor party, pre-wedding rituals in our Spa, an enchanting aperitif by a garden fountain or a subtle post-wedding day celebration. The meeting can be arranged by e-mail (marketing@quadrille.pl) or phone (+48 58 351 03 14). We strongly believe that our Wonderland will amaze you as our motto: Experience the Wonderland.